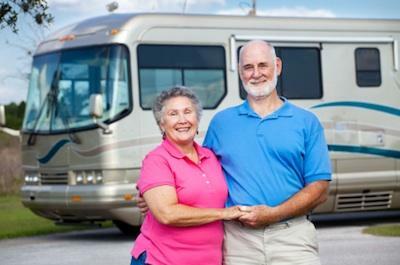 Flying J RV camping locations are a safe and free camping spot to take advantage of when you are on a cross-country RV road trip. If you are taking an RV trip, an occasional night spent at a Flying J truck stop can be a great option. Flying J truck stops are all over the United States and Canada and allow truckers and RVers to stay the night for free. You might be asking why Flying J lets you stay for free. The answer is simple, in the morning you will probably fill your RV up with gas bought at their gas station, eat breakfast in the restaurant nearby and purchase items needed for your trip in their store. The Flying J truck stops are the largest network of RV friendly sites in Northern America. To locate a Flying J near you, see the Flying J Map on the company's website. For all the positive benefits of camping at a Flying J, there are a few inconveniences. For example, don't expect the camping area to be scenic or pretty; it is a truck stop. Following are a few more inconveniences you should expect. Probably the biggest reason you would not want to stay more than one night at a Flying J is the fact that slide outs are generally not allowed. There is usually not enough room in the parking lot and if a driver can't see your slide-out in the dark, he may run into it. Truckers pull into the Flying J during all hours of the day and night. Semi-trucks are noisy and sometimes truck drivers will keep their engines running for long periods of time. Do not expect to use your outdoor bar-b-que grill when you go Flying J RV camping. Setting up your outdoor grill will take up space and possibly send smoke into the windows of the other trucks and RV's. Before you hit the road, check out the Flying J website to plan your trip. If you need any information that the website does not address, call the company's toll free number: 1-800-562-6210.